Kanan is 8 months Old! It is so hard to come to terms with Kanan turning 8 months old. It seems like just yesterday…..well you know the rest; it is a line every mother says a thousand times in her life. I think I have already said it a dozen times thus far. Regardless, my little baby is a soon-to-be-toddler. Just yesterday he started “cruising” along the furniture and around the inside of his pack-n-play when we put him in it. It is not a whole lot. I don’t even think he realized that he has done it, but he has. I’ll give it a couple more days until he realizes what he can do and then that is all he will want to do all day (phew!) For pics of this month click HERE! Videos of this month are mixed in with the pics. Kanan weighs 20 lbs. He is still 28 1/2 inches long. He is eating pureed meats now including chicken and beef. He loves beef (red meat lover just like his mother) but needs to mix his chicken with fruit in order for him to tolerate it. He is using his pincer grasp now as well and so I am including some finger foods with every meal for him to practice with. Sometimes he gets it into his mouth and sometimes he just fusses for me to do it. He loves, Loves, LOVES bite size pieces of cheese (my little mouse) and he also likes Gerber Graduates freeze dried bananas and strawberries. He also practices drinking from a sippy cup during his meals with me and does drink it successfully but not of course without dumping a lot of it all over himself and his highchair tray (I have to take the plug out because he can’t figure out how to get the water out with it in just yet). 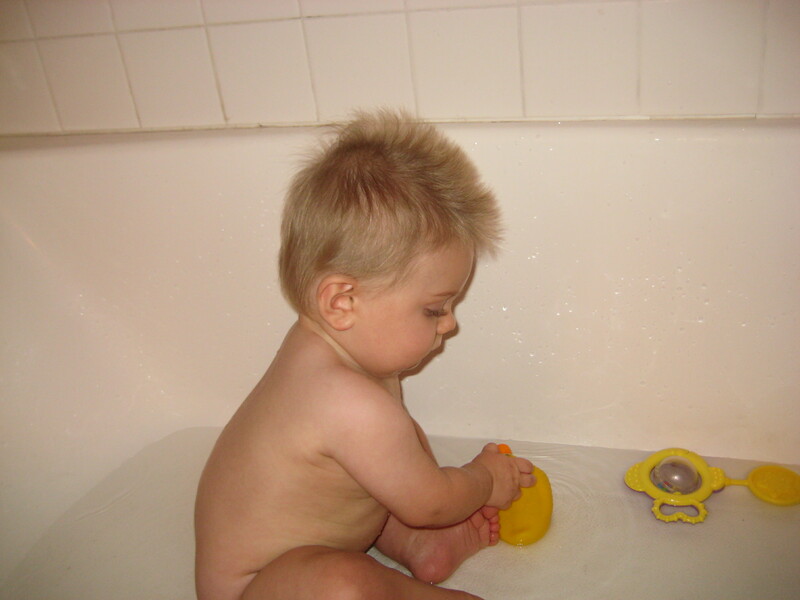 Kanan is also taking a bath in the regular bathtub now just like a big boy (as you can see in the pic above). We fill the bathtub up to a little below his waist and he has a great time crawling around, sucking on his water toys, and trying to stand up in the tub. It is definitely a lot of work for me because I am constantly grabbing him when he tries to stand because I don’t want him slipping. But his graduation to the big boy bathtub has made him much happier with bath-time. He squeals and laughs and even in his grumpiest moments transforms into the happiest baby on the block when it is bath-time. This last weekend, Mike and I went on our first trip away from Kanan. Kanan’s Grammy Joella and Grandpa Don came all the way down from Reno to babysit and Kanan didn’t even register that we were gone the entire trip! The little booger! He had a wonderful time with his grandparents and of course, they fell in love with him even more. They said that he was “mild-mannered, relaxed, and a good, happy baby.” I guess they didn’t notice that he has twinkle toes like his father! Over all we have had a wonderful month. We are waiting on teeth still, but that is the only milestone on which Kanan seems behind. But we are late teethers and early walkers in our family, so it looks like he is just keeping it in the family way. We are moving here in a week and will have to make some adjustments with our smaller place, but we feel Kanan will do just fine in the transition. 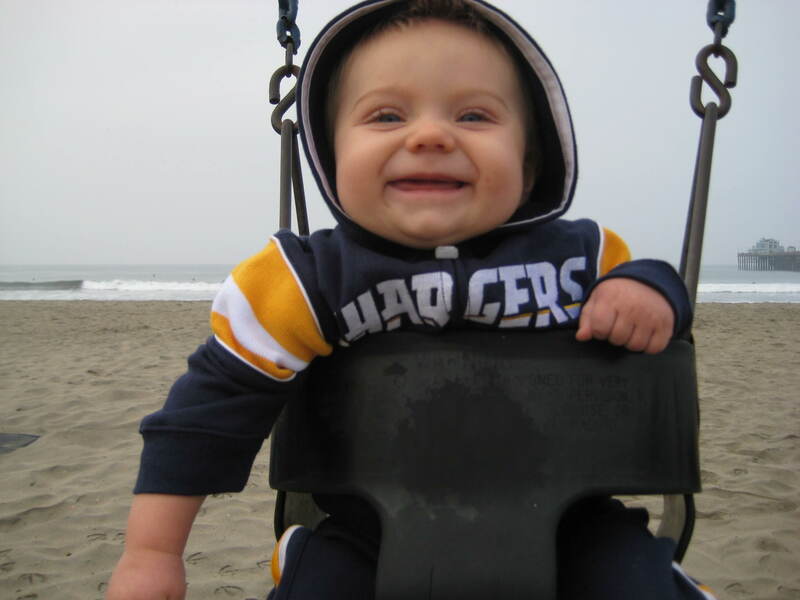 And we will be living one-block away from the sand so Kanan’s new backyard will be the ocean! And he is going to see it everyday because without a backyard, we will have to take the boys out for walks everyday. I guess I’ll finally get a chance to lose that last 5 lbs that have been hanging on me like a codependent friend. Good Riddance! A great update! I have so many questions for you now! I’m still in FL on vacation. It’s going welll and Xander’s been such a good little boy. He just getting a bit sleepier sooner than normal. Will write soon!